In a large saute pan, heat vegetable broth, Braggs and sherry, then add artichokes. Cover with lid and simmer the artichokes for about 3 minutes, or until tender. With a slotted spoon remove the artichokes to a bowl and reserve, leaving the vegetable broth in the pan. Now add mushrooms, zucchini and peas. Simmer these vegetables for 2 minutes. Remove and reserve. Add olive oil and garlic to saute pan, simmer garlic until it becomes soft. Add tomatoes with juice, sugar, oregano, basil, cinnamon and cayenne. Continue to simmer this mixture for 5 minutes. Cook pasta according to package directions. Reserve 1/2 cup of pasta water, then drain pasta and add to saute pan. Add reserved vegetables (with their juices), pasta water and half of the grated cheese. Gently mix while heating all the ingredients. 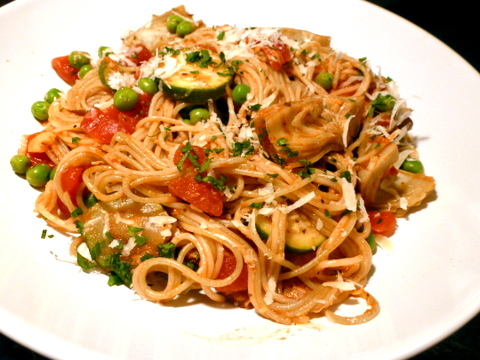 Divide the pasta and vegetables among the bowls and top with more cheese.